Dock lines secure your boat to a dock, or to another boat when rafting, either temporarily or semi-permanently. These applications demand different types of dock lines. Typical Dock Line Arrangement. The powerboat is using double bow and stern lines to keep the boat away from the dock. The sailboat is using spring lines to prevent fore and aft surging, while the bow and stern lines "locate" the boats. Are you buying dock lines for temporary use (transient dock lines for use while away from your home port) or for your permanent slip? When your boat is away from its regular slip or mooring, you need to have some designated nylon lines aboard, preferably with spliced eyes, ready for use when you tie up somewhere. We call these transient dock lines. The eye in the end is easily passed around a cleat or piling by someone on the dock and the bitter end is adjusted on board. There are dozens of combinations of diameters and lengths. Permanent dock lines are also made of nylon, but differ from transient dock lines in several ways. First, they must be protected from chafe, the enemy of all lines in constant use. This calls for leather, rubber or fabric chafe gear where the line passes through the chocks, and possibly a chafe sleeve on the eye where it goes around the cleat on deck. At the dock, lines should be protected from chafe using eye splices and shackles if the dock has rings, or eye splices and short lengths of chain if the dock has cleats. Permanent dock lines should be cut to fit the particular boat in the slip. Do you prefer braided or three-strand dock lines? Three types of rope construction. Dock lines should be made from nylon, a synthetic fiber that has a superior combination of strength and stretch. Nylon is strong (although it shrinks and loses about 10-15% of its strength when wet), durable, and stretchy (three-strand nylon stretches up to 16% of its length when loaded to 15% of its breaking strength), so it absorbs shocks. 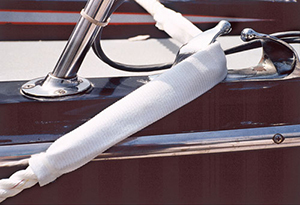 Low-stretch lines, like old worn-out polyester double braid used for sailboat running rigging, are less desirable because they transmit shocks from waves, loading up and loosening dock cleats and your boat's deck hardware. 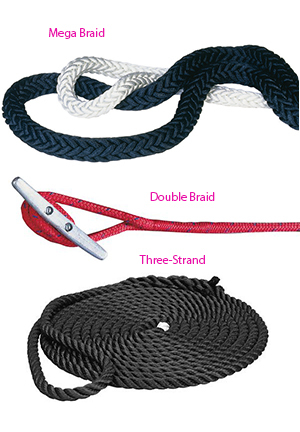 There are three main types of rope construction for dock lines: three-strand, double braid and Mega Braid. Three-strand line has a knobby finish, is easy to splice and is the most affordable. Double braid is somewhat stronger for a given size, has about half of three-strand's stretch, and is available in many colors so you can color-coordinate your dock lines to match the color of your trim or canvas. Mega Braid is a 12-strand single braid from New England Ropes. Single braids are very supple and limp, so they are easy to coil and handle. Mega Braid is frequently the choice for boats above 70'. It is harder to splice, so boaters may want to order custom Mega Braid from West Marine Rigging. Mega Braid comes in white or black. Do you want colored dock lines? Many boaters will want lines which match their canvas work, or trim color. Double braided dock lines are available in six colors plus white and white/gold. We recommend 1/8" of line diameter for every 9' of boat length. Larger lines will wear longer but stretch less. 3/8" 7/16" 1/2" 5/8" 3/4" 7/8" 1"
These 18" polyester Chafe Guards are sold in pairs. Long dock lines stretch plenty to absorb shocks. Short lines can benefit from a snubber to add more stretch. A strong and professional way to connect your dock lines with chain. 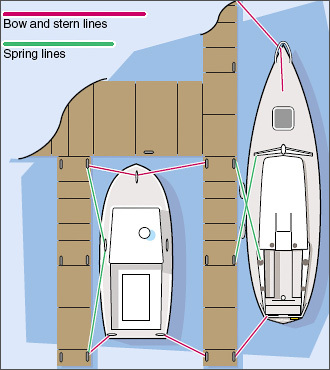 Transient dock lines should be about 2/3 of the boat's length when used on the bow and stern. Spring lines should be equal to your boat's length. Chafe is the damage caused by rubbing lines or sails on surfaces. It is inevitable, but can be reduced by not changing the angle of a line abruptly and by using abrasion-resistant pads, such as lengths of leather or hose, called chafing gear. Even smooth, large radius surfaces will abrade nylon and polyester lines over time. Chafe guards provide a sacrificial surface that can take the damage without reducing the breaking strength of the line. 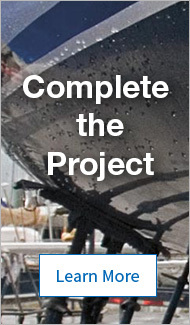 Commonly, docks will have eyebolts, rings, or galvanized cleats where the dock lines are made fast. The type of hardware on the dock or piling determines the best type of dock line splice and chafe protection. For example, you may want to have an eye splice around a thimble, and a galvanized shackle when connecting to a ring or eyebolt. If there is a large cleat, you may choose to take a short loop of chain around the base of the cleat and through a galvanized thimble. Either of these methods will last far longer than simply tying the line around the dock hardware. Dock Line Snubbers will help add some shock-absorbing stretch to your dock lines. Long dock lines usually have enough stretch to absorb shocks. Shorter dock lines may not have enough elasticity. For example, my boat has one stern line that used to always jerk sharply and noisily on my boat's cleat, until I installed a snubber. Connecting to the Dock Hardware: You've got a choice on how to prevent chafe at the dock. In our local harbor, we have large galvanized cleats, so we use a loop of chain about a food in diameter through the center of the cleat and the thimble. We close the loop of chain with chain link or a common shackle. At some point if we need to replace the chain, we can cut if off with a hacksaw. Note that this method of attachment completely reduces the chafe at the dock, and also prevents dock lines from being stolen. 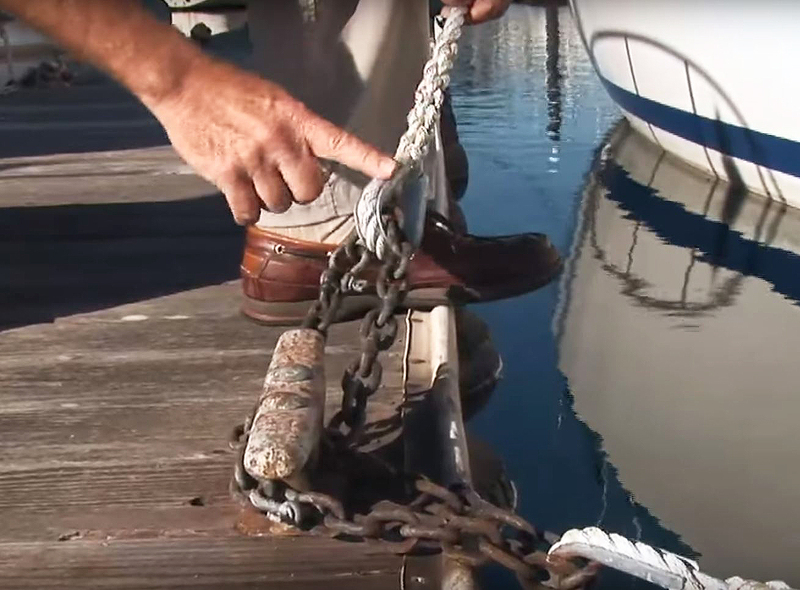 Your harbor or marina may use galvanized eyes or other connection points, so you may be able to use shackles or some other means of attachment.